Considering the subject matter, humans come off looking surprisingly good in the new HBO documentary “Unlocking the Cage” from renowned documentarians Chris Hegedus and DA Pennebaker. We seem like a logical, humorous, intelligent, empathetic species that’s generally working towards a greater good. There is a lot of crying and scant irrationality. If only reality so easily met these standards on a daily basis. However, the true stars of the film, chimpanzees, don’t look so good. For the most part they are stuck behind bars, often alone, and clearly distressed if not openly angry or hostile. The problem, as Steven Wise, an intrepid animal rights lawyer and star of the documentary sees it, is that chimpanzees have no rights. As a matter of fact, no nonhuman animals have rights. There are laws guiding how animals can be treated and protected, but these laws don’t grant any type of legal “personhood” to the creatures. Chimpanzees can be held against their will—basically as property—for indeterminate and indefinite periods of time. Wise wants to change all this, and the documentary tracks some exciting recent developments in his 30-year effort to redirect the law for the benefit of nonhuman animals. 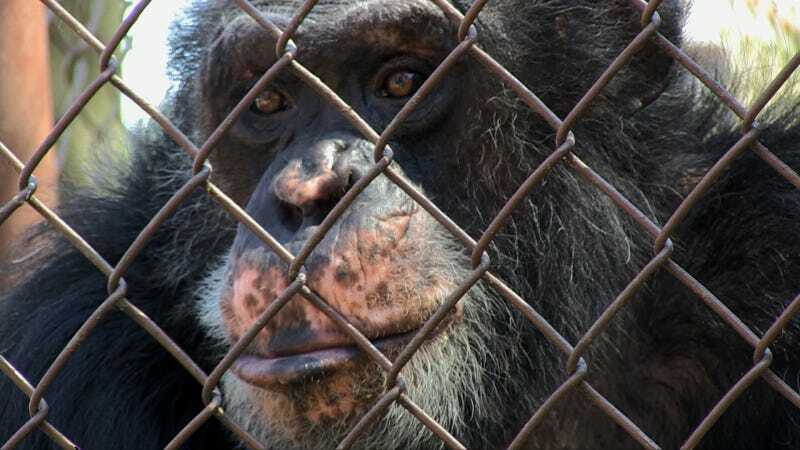 Wise and his legal team, the Nonhuman Rights Project (NhRP), have taken it upon themselves to file the first lawsuits seeking to transform an animal, in this case a chimpanzee, from a “thing” with no rights to a “person” with legal rights. If all goes well, chimpanzees that are being kept captive in ways significantly inhibiting their self-determination and autonomy—basically chimps held in cages with little social interaction—will have the right to be moved to more welcoming locations, such as the 150-acre Save the Chimps facility in Florida. Wise and his team want chimps and other animals that meet predetermined cognitive benchmarks to be granted certain fundamental personhood rights that at the very least protect them from physical abuse. And they are willing to file lawsuits, and appeal decisions, and file more lawsuits—which they've been doing with moderate progress for the last three years with the filmmakers along for the ride. Before getting all excited, remember that this is the U.S. legal system we are talking about. It moves painfully slowly as judges are hesitant to extend the arc of justice much more than a degree at a time. Wise, who spends a decent chunk of the film either expounding into the camera while he drives (these were some of the tensest moments of for me, at one point a mail truck merges precariously onto the road) or in front of a skeptical courtroom, says as much. The goal of the lawsuits, all filed in New York, is to get the conversation started, to get some nonhuman animal legalese into the books, and to begin the process that could one day lead to the takeover of the planet by angry apes. No wait, that’s another plotline but you get the idea. While “Unlocking the Cage” might not be as mesmerizing as any of the “Planet of the Apes” films, it’s just as captivating and much more thought-provoking. Even the scenes stock full of legal jargon—I’m pretty sure I will forever know what habeas corpus is—managed to keep the argument moving at a pace viewers can appreciate for both depth and restraint. What really shines through though is the jaw-dropping intelligence of the chimps. They can communicate in sign language, memorize complex patterns, and navigate certain computer interfaces with ease. And damn, can they mourn. When Wise visits an elder chimp three days after the death of its long-time companion, the animal is unresponsive to a heart-wrenching degree as he cowers in the corner of his caged outdoor enclosure. On the drive back, Wise says that was one “depressed” animal. Depressed animals, while tear-jerking, are not a legal argument for granting personhood rights to nonhuman animals, and while the cases focus on a few chimps, the courtroom scenes revolve around the broader debate and implications. Wise and his team meet with extremely disappointing results in the first two encounters with courts as the judges are left unswayed by his arguments. For one, they are put off by the notion of giving animals rights without them having any responsibilities. Wise tries to draw an analogy here with children, but it falls short as the differences when scrutinized are quite great. One of the appellate courts decides that chimpanzees, as a species, cannot bear rights and responsibilities–which is considered a legal qualification for personhood. Therefore, the court concludes that the chimpanzees are not entitled the rights and protections afforded by the the writ of habeas corpus—a right that allows prisoners to seek relief from unlawful detention. Judges and lawyers throughout the film also worry about the slippery slope nature of the arguments, which a 2014 clip from The Colbert Report sums up when Stephen Colbert asks Wise if his dog will soon be able to sue him for not being allowed on the couch. In the climax of the film, Wise gets a chance to present his arguments to Justice Barbara Jaffe on the New York County Supreme Court in Manhattan. Justice Jaffe seems the most compelled by the subject matter of any judge yet, but in the end feels bound by the conclusions of the state appellate court. Still she says that “efforts to extend legal rights to chimpanzees are thus understandable; some day they may even succeed. Courts, however, are slow to embrace change, and occasionally seem reluctant to engage in broader, more inclusive interpretations of the law." If not a full victory, Wise and his team view this ruling as highly encouraging. With the ball rolling on chimpanzees’ rights, the Nonhuman Rights Project is moving on to the second of a small group of animals that it has deemed cognitively complex enough for this initial round of legal navigation—elephants. Specifically elephants in a traveling zoo. Like the chimpanzees, these lawsuits will be the first cases of their kind. Coincidentally or not, the Ringling Bros. Circus recently retired its elephant show after 145 years and untold pressure from animal rights groups. The 11 performing elephants will be sent to a conservation area in Florida. This move falls in line with Wise’s general impression that his ideas about animal rights, first conceived of 30 years ago, were way ahead of their time. He posits that mainstream culture is just now starting to account for the quite impressive intelligence of nonhuman animals and to reckon with the way humans treat them. If I had to pinpoint a moment when this movement really took off, it would be with the release of the 2012 film “Blackfish” documenting the way SeaWorld treats captive killer whales. No one could have quite predicted the extreme backlash against the company that the admittedly outraging film produced, and in the several years since SeaWorld has been through the wringer and back. In SeaWorld's boldest move yet at rehabilitating its image, the company recently announced that it will officially be phasing out its live orca shows and it will no longer breed or keep killer whales in captivity. Surely Hegedus and Pennebaker hope the release of “Unlocking the Cage” will provide a similar jolt to the nonhuman animal rights movement, and that the film will make people more overtly aware, and more self-critical, or their relationships with animals. Unlike dogs and cats, the treatment of captive wild animals such as killer whales, elephants, and chimps can often fall prey to the out of site, out of mind mentality. It can take a compelling film that drops at the right cultural moment to galvanize enough momentum for any sort of long-term change to occur. After all, without society and all its trappings we are all just animals, human or not. While we may forget this, the law never does. “Unlocking the Cage” was an official selection of the 2016 Sundance Film Festival. It will open nationally in June.